Now that Christmas is over we are all waiting to usher in the New Year so I am taking this time to catch up on "old" stuff and get ready for the new year. 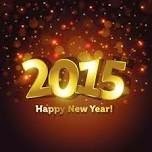 I want to wish all of you a HAPPY NEW YEAR!! And have a wonderful 2015!